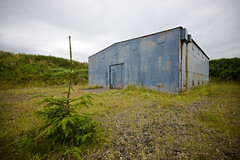 An explosives factory has been identified on the former site of Benhar Colliery which once lay southwest of Harthill and was an extensive colliery which can be dated back to 1793, and was served by its own railway sidings and tramway. Mining ended there when the last pit closed in 1962. Much of the area was destroyed through the effects of opencast mining and the recycling of the old pit bings, followed by the lifting of all the tracks. The abandoned mine area was taken over by an explosives manufacturer, and an L shaped complex comprising of at least seven building provided with protective earth banking was installed, together with with what appears to be a network of six settling ponds. An aerial survey carried out in 1975 did not show this installation, indicating that it was constructed after that date, although the actual date is unknown. In March 2007, a store on West Benhar Road, Harthill, Shotts, was the subject of an appeal to the Local Valuation Panel by Explosive Developments Ltd. The rateable value was then given as �61,000. Company No. 00905763. Status: Active. Company No. 01779135. Status: Active. 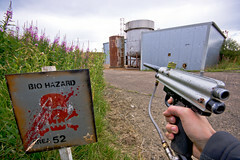 The site is now used by a paintballing company - most buildings are still standing but either locked or empty. The company has modified some of the lightweight buildings, built a couple of fake tanks and helicopters, and put up some amusing signs.